Flying SFO-IAH, our United pilot requested a "Bay departure" from air traffic control, and they delivered. We were instructed to stay over the water at 4000ft until past the Golden Gate (pictured just under the wing to the right). The Bay Bridge is at the bottom. It was well worthwhile! 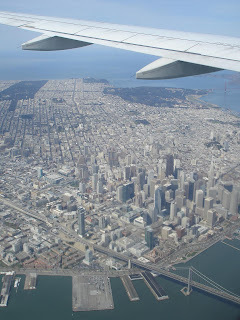 I've flown over downtown San Francisco a few times, but never that low. Apologies for the lack of clarity around the Transamerica building in the picture - the jet exhaust makes it look poorly focused.